UK Government borrowing in November fell to £14.1 billion, which was over 10% (£1.6 billion) lower than in November 2013, the Office for National Statistics (ONS) reported on Friday. The decline was helped by a £1.1 billion settlement between banks and regulators who had been investigating a foreign exchange rate fixing scandal. Income tax receipts, which have been much weaker than expected throughout the whole year given the increase in employment, also rose in November. Britain’s pay growth has been lower than the inflation rate for nearly five years, while the threshold for paying income tax has increased. Despite higher Government revenue in November, there is no way Chancellor George Osborne will meet his full-year borrowing target unless he cuts spending by 40%. While maintaining the UK’s sovereign debt rating of AAA, Standard & Poor’s said it doubted Mr. Osborne would manage to meet his budget deficit target. Public sector net borrowing, which excludes public sector banks (PSNB ex) for the April-November 2014 period was £75.8 billion, which was £0.5 billion less than in the same period last year. Source: “Summary of latest net debt and net borrowing,” Office for National Statistics. As monthly data can be volatile, the ONS says it is better to gauge public finance progress by examining the April-November period. For the April-November period, the central government net cash requirement (CGNCR) was £63.3 billion, which was £17.3 billion higher versus the same period last year. This was mainly due to cash transfers from the Asset Purchase Facility being £20.2 billion so far this year, compared to the same period last year. 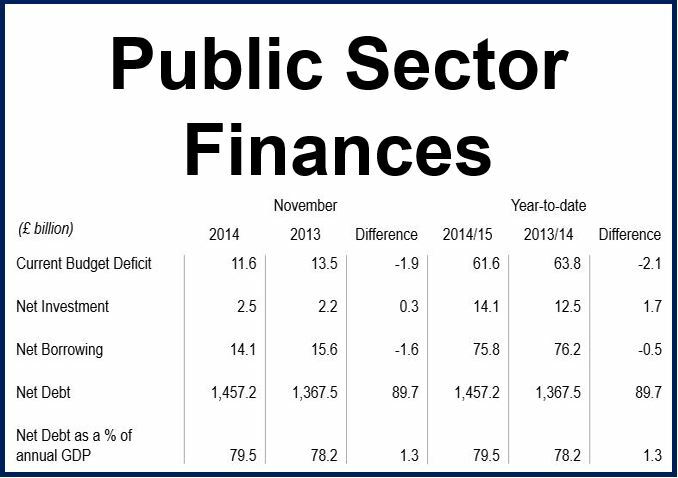 Public sector net debt excluding public sector banks came in at £1,457.2 billion at the end of November 2014, i.e. 79.5% of GDP. This represented an £89.7 billion increase over November last year. At the end of November 2014, the Maastricht debt (General Government Gross Debt) was £1,583.3 billion, while the Maastricht Deficit (General Government Net Borrowing) was £100.4 billion. Since coming to power in 2010, the Conservative-Liberal coalition has made reducing the deficit a priority. Sluggish GDP growth in 2011/2012 means it will miss its target of eliminating most of the deficit by 2015 by a long way. Mr. Osborne said his goal now is to deliver a hefty overall budget surplus by 2020, that is of course, if the Conservatives or a Conservative coalition manage to win May’s general elections. The Labour party pledged to eliminate the deficit on the current budget as soon as possible if it is elected to government in 2015.